The hotel’s exterior features a sleek marquee with the TI initials. One of Treasure Island’s big features is Gilley’s Saloon, Dance Hall & Bar-B-Q, which has something for everyone. The saloon portion offers bikini bull riding contests, multiple bars, a stage, a dance floor and a “big Texas” attitude. The restaurant, which fronts the Strip, features barbecue-style favorites including ribs, big burgers and pork sliders. There’s also an outdoor patio. The rowdy Señor Frog’s bar and restaurant, a party staple in Mexico, adds to the nightlife scene now. Visitors flock to Vegas to relax, play and eat well, and Treasure Island has met the challenge of accommodating even the most sophisticated tourist, most aggressive card shark and most selective diner. The hotel’s spacious guest rooms feature floor-to-ceiling windows, allowing spectacular views of the Strip. They also boast the exclusive Elite Sensational pillow-top beds, flat-screen LCD TVs, small refrigerators, private safes and large soaking bathtubs. The sprawling casino includes a small but stylish poker room, a race and sports book, several thousand slot and video poker machines as well as plenty of table games. Phil’s Italian Steakhouse celebrates the best of Italian and American cuisines. The Vietnamese-themed Pho is a restaurant within a restaurant, located in The Coffee Shop. A world-class selection of dishes is also available for breakfast, lunch, dinner and weekend champagne brunch in The Buffet at TI. And Little Richie’s Chicago-Style Beef and Dogs is a hot dog stand situated near the poker room and sports book. Included in Treasure Island’s entertainment offerings is the visually stunning “Mystère” by Cirque du Soleil, now nearly through its second decade of highly acclaimed performances. The hotel recently opened a highly interactive attraction for the masses. With state-of-the-art equipment, Marvel’s Avengers S.T.A.T.I.O.N lets the whole family become secret agents. Top secret intelligence files, classified studies, and experiments lead you to a one-of-a-kind experience. The pool features private cabanas and a party tub that fits 25 people. For some pampering, Oleksandra Spa & Salon offers luxurious treatments in a facility designed by a former Miss Universe contestant. 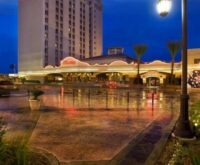 Topping it all off, the resort is conveniently located, offering a tram to the neighboring Mirage and a pedestrian bridge across Spring Mountain to the Fashion Show mall. There’s also a three-story, 48,000-square-foot retail center on the northeast corner of the property opposite the Fashion Show mall that’s anchored by CVS. With the wealth of riches at Treasure Island, it’s no wonder that once you’ve set sail with this crew, you’ll never want to return to port again.